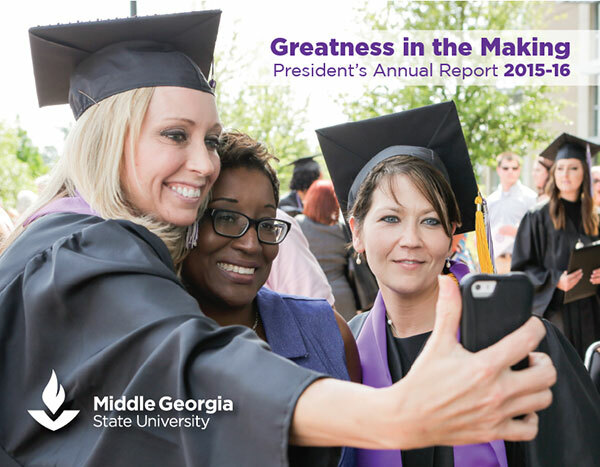 Middle Georgia State University President Christopher Blake released his 2015-16 Annual Report, “Greatness in the Making, publicly this week. The report showcases advances made by the University related to its four core values: Stewardship, Engagement, Adaptability, and Learning. “Having completed our first year as a University, I am pleased to present our inaugural President’s Annual Report, writes Blake. “The data and stories captured here provide a glimpse into the incredible return on investment made possible through ingenuity and creativity across the institution. “Greatness in the Making also presents some basic facts about the University’s economic impact in its 13-county region, its funding, enrollment, and housing, as well as a profile of the 2016 President’s Scholar.